For me every recipe tells a story that reflects back on its culture, time and place. And when that recipe is Jewish, there is also centuries if not millennia of tradition and religious observance to understand as well. The best of the new crop of Jewish-themed cookbooks help tell the stories of Jews and the food they ate from ancient Israel to New York's Lower East Side immigrants to the present day North African Jews in France. Plus any one of these books would make a swell Chanukah (Hanukkah) present. “It gives you a sense of this is what our ancestors ate,” said Chaim Mahgal-Friedman, owner of Afikomen, Berkeley, CA, of the new edition of Kitty Morse’s “A Biblical Feast: Ancient Mediterranean Flavors for Today’s Table.” All recipes use ingredients thought to be used during the time of the bible in the Jordan River Valley. Mahgal-Friedman also likes how the book has clear instructions on how to go back to basics and make your own goat cheese, unleavened breads and sourdough starter. Morse’s self-published book is “beautifully illustrated” and easy to use, he said. Afikomen is known for its large selection of Jewish cookbooks. Mahgal-Friedman also recommended “The Book of New Israeli Food” (Schocken) by famed Israeli food writer Janna Gur. Gur’s book is a few years old but gained local attention this past year with a display of Eilon Paz’s stunning food photographs from the book at the Peninsula Jewish Community Center in Foster City and Gur’s appearances around the Bay area. Another recent book Mahgal-Friedman is excited about is “The Complete Asian Kosher Cookbook” (Targum Press) by the mother/daughter team of Shifrah Devorah Witt and Zipporah Malka Heller. The duo adapts Chinese, Japanese, Filipino, Thai and other Asian favorites so they can be made kosher with easy-to-find ingredients but still taste authentic. Two new books have the attention of Celia Sack of Omnivore Books on Food in San Francisco, CA. She is looking forward to stocking Paula Shoyer’s “The Kosher Baker” (Brandeis), a collection of 160 dairy-free dessert recipes that include such delights as Babbka Cupcakes with Crumb Topping, Cinnamon, Vanilla, & Raspberry Macaroons, and Chocolate Peanut Butter Mousse Cakes. “I think it’s the best thing coming out right now. It's a beautiful book, and I don't think the topic has ever been written about this extensively,” Sack said. Sack also recommends “97 Orchard: An Edible History of Five Immigrant Families in One New York Tenement.” The author, Jane Ziegelman, is the head of the culinary department at the Tenement Museum in New York City. The museum has restored an 1863 tenement-style apartment house and shares the stories of some of the almost 7,000 people who lived there in the 19th and 20th centuries. “97 Orchard,” published by Harper Collins this summer, was on several booksellers’ lists. The book details the food ways of five different immigrant families who lived in the tenement on New York’s Lower East Side. It includes 40 recipes from the families’ German, Italian, Irish and Reform and Orthodox Jewish traditions. Nurit Sabadosh, owner of Alef Bet Judaica in Los Gatos, CA, is also featuring the “New Book of Israeli Food” and is looking forward to stocking the latest book in the “Kosher by Design” series. The books, by Susie Fishbein, are bestsellers for Alef Bet and Sabadosh expects the newest one, “Kosher by Design: Teens and 20-Somethings” (Shaar Press), to be popular as well. The book features alternatives to fast food that can be made with no special equipment and little or no cooking skills. At Dayneu, a Judaica store in San Francisco, CA, co-owners Eva-Lynne Leibman and Hiroko Nogami-Rosen also carry the Kosher by Design series. They say they are looking forward to “Quiches, Kugels and Couscous: My Search for Jewish Cooking in France” (Knopf) by Joan Nathan, author of long-time favorite “Jewish Cooking in America” (Knopf). The book traces culinary influences as Jewish food in France evolved and then influenced general cooking in France. Another stalwart of Jewish cuisine also has a new book on Jewish food out. The “Encyclopedia of Jewish Food” (Wiley) by Gil Marks, rabbi, chef and historian and author of “Olive Trees and Honey: A Treasury of Vegetarian Recipes from Jewish Communities Around the World” (Wiley) and other books, is part comprehensive food history book, part cookbook, part cultural anthropology text and more. It explains not only what foods such as ajin taimani (Yemenite bread), kichel (Ashkenazi egg cookie) and yakhna (a Persian meat stew) are but why they came about, where they migrated from and how they changed over time, often with recipes. The book also contains listings for Jewish holidays, food customs and a Jewish food history timeline. Marks’ background as a chef, rabbi and historian shines through in this well-written book. For anyone who wants to learn more about Jewish tradition and life it is a valuable resource. For those of us who enjoy exploring our own and others Jewish food heritages it is an invaluable one. Take for example the potato knish. Marks’ listing for knish opens with a quote from writer Sholem Aleichem, describes its origins as a medieval Polish fried patty and traces its evolution into “a small, round, fried, filled pastry” and then to a baked form similar to what we know today. The knish’s importance increased as the availability of home ovens did and the importation and cultivation of the New World potato into the Old World created the potato filling I so fondly remember. The entry goes on to detail the changes to the knish and prominent events in its history after it crossed back to the New World and concludes with the role the pastry now plays in Israel. Here is my adaptation of Marks’ recipe for “Ashkenazic Filled Pastries,” or knishes, from the "Encylopedia of Jewish Food." Note: Marks does not specify what kind of potato to use. I used large creamers, similar to new potatoes. While I loved the rich onion taste of this traditional recipe, I also liked my spicier Southwestern variation below with roasted green chilies and cheese. Make the pastry: Boil potatoes in lightly salted water until tender. Cool. Put through a food mill or slip off skins and mash. Use 2 cups of the mashed potato for the dough. Reserve extra for another use. In a large bowl, combine the mashed potatoes, eggs, shortening and salt. Slowly add in flour and stir until soft dough forms and the no more flour is absorbed. Mix the dough with your hands if needed. Knead the dough for a minute or two on a lightly floured surface. Cut into fourths, shape each into a round and wrap with plastic wrap. Refrigerate for at least 2 hours or overnight. Make the filling. Prepare the potatoes as described above. Use 2 ½ cups for the filling. Heat the oil in a large fry pan and sauté the chopped onions over medium heat until golden brown. Stir into the potatoes. Add salt and pepper. Cool. Taste and correct seasonings. Stir in the egg. To assemble: Preheat oven to 375 degrees. Grease a large baking tray or line with parchment paper. On a lightly floured surface, roll out the dough to 1/8” thick. For large knishes, cut 5” by 4” rectangles. For small ones, cut into 3” squares. 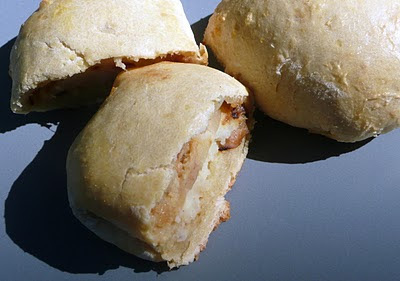 Put ¼ cup of filling in each larger knish and about 1 Tbs. filling into the smaller ones. Draw edges together and pinch to seal. Put seam side down on baking tray. Brush with egg wash. Bake until lightly browned, about 20-25 minutes. Serve warm or at room temperature. Southwestern Variation: Use 2 cups of mashed potato for the filling. Add 2 cups of shredded cheese and ¼ to ½ cup of roasted, peeled and chopped green chilies to the filling mixture. This post was adapted from a new cookbook round up and a piece on potato knishes I wrote that appeared in the j. weekly. Spicy Southwestern knish! That sounds crazy...good. Great round-up of books, Faith. Can't wait to check them out in more detail. Wow, what a feast of Jewish cookbooks. Guess it's time to retire my Jennie Grossinger. Anna - Jennie's was my first Jewish cookbook. I loved it. It was just like grandma's food. My sister still has my copy. Plus, my paternal grandparents lived in Ellenville and Grandpa was a plumber who occ. worked at Grossinger's, so I always felt like there was a real connection. DJ - as always, thanks. It looks great! Might have to buy it! Marlena Spieler's Jewish Cooking was my first Jewish Cookbook..and I still love it.